Hideo Kojima himself confirms that the Metal Gear Series will get HD treatment and will be available on both the PS3 and Xbox 360. 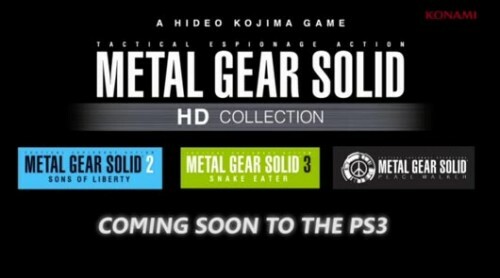 The aptly named Metal Gear HD collection will include, Metal Gear Solid 2: Sons of Liberty, Metal Gear Solid 3: Snake Eater and Metal Gear Solid: Peace Walker (what no Metal Gear solid? O_O). The “Transfarring” system that Kojima mentions in the video will allow you to use one save file for the PS3 and PSP copies of the game. So far, only Metal Gear Solid: Peace Walker is set to have the “Transfarring” (which probably means transferring but in Kojima-speak) which sounds quite similar to what Capcom has in stored for Monster Hunter Portable 3rd HD. The Metal Gear Solid HD Collection will be available this November, while the Zone of the Enders HD Collection will be out sometime in 2012.